The very talented playwright Ayad Akhtar has combined all of these viewpoints with a political thriller to create the compelling The Invisible Hand now getting an excellent production at TheaterWorks through Sunday, June 24. The play opens with Nick Bright (is the name a little too symbolic?) handcuffed in a small room with an obviously Muslim guard, Dar. During the exposition we learn that Nick works for Citibank in Pakistan and has been kidnapped partly by mistake; the group wanted his boss. They have demanded a $10 million ransom but nothing is happening. The group led by Imam Saleem; wants to use the ransom to fund economic and health projects to help the country. Saleem’s lieutenant is Bashir, whose parents left Pakistan for England years ago. Nick is a brilliant trader in all sorts of financial instruments, able to determine how to make money in almost any situation and to find “the edge.” He is also very knowledgeable about Pakistani politics, in fact he has advised the minister of water. As the first act unfolds we see the gratuitous cruelty (Bashir kicks Dar in the groin), the despair of Nick and the intricacies of the relationship between Bashir and Saleem. Since the bank seems in no hurry to pay the ransom, Nick and Saleem negotiate a deal. If Nick can make his ransom within one year, using money he has stashed in a Cayman Island account to start, he will be released. Bakshir will be his assistant and Nick is charged with teaching him how the markets operate. Thus the title: The Invisible Hand. The term was coined by the Scottish economist Adam Smith to describe the unintended social benefits that arise from individuals pursuing their self-interests; that they balance out each other for the good of the whole. Nick and Bakshir set to work; soon Bakshir gains some knowledge of an impending political assassination by another group and Nick parlays that into a $700,000 gain. But fissures start to appear. Barkshir feels he is being used as an errand boy, not a student and the Iman takes $400,000 from the working capital account to purchase vaccines. Nick suspects a large part of that went into the Iman’s pockets. The three men clash with Nick often forgetting that he is their captive and at their mercy. He believes they need him for his ability to “create” money. The Iman, while autocratic and ruthless, seems more practical than the younger Bakshir who is filled with resentment for the Western world and its values. He remembers the numerous slights and insults he endured in England. At times the dialogue may seem like a class in economics with the discussion of the Bretton Woods agreement after WWII that made the American dollar the de facto monetary standard for the world, to the meanings of stock market terminology such as “put” and “calls.” Yet it is clear and helpful to understand the types of financials deals that Bright is doing. Yet, it never becomes dry or boring. We are caught up in the suspense. Will Nick succeed in raising his ransom? Will his captors actually release him? As Bakshir gains knowledge will he challenge either Nick or the Iman? In keeping with the political thriller genre, I won’t tell the answers to any of this. Let’s say some of it was predictable and some was not. Playwright Akhtar, who wrote the Pulitzer Prize winning Disgraced has again created a play that will have you leaving the theater thinking. While American born and raised, Akhtar has an almost innate understanding of the perceptions and philosophy of the Islamic world. He is able to let us into a world that to Americans seems strange and perhaps “wrong.” He also articulates how the third world sees the dominant political and economic powers, of which the US is the most powerful. 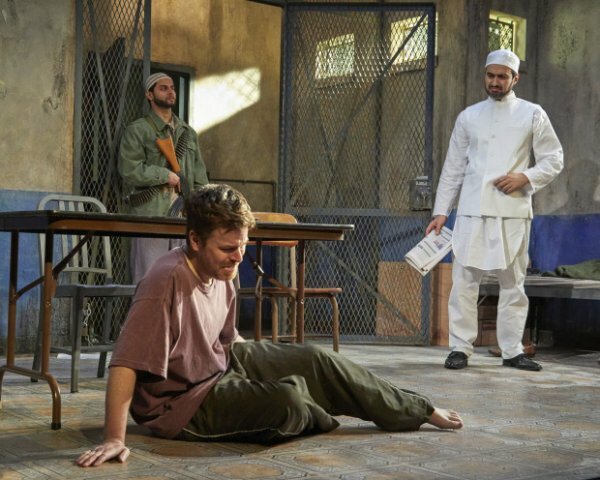 The production at TheaterWorks is a revision of the award winning production presented at Westport Country Playhouse in 2016. The director and most of the cast have returned. That production was honored as the outstanding production of a play in Connecticut, as well as outstanding direction and outstanding leading actor from the Connecticut Critics Circle. Director David Kennedy has kept the pacing tight and helped the actors delineate their very different characters. Working in the more intimate TheaterWorks space, Kennedy has made the work seem even more intense and suspenseful. Rajesh Bose, who played the lead in Akhtar’s Disgraced at Long Wharf (and won awards) plays the Iman. He has to convince us that this pragmatic man who will let Nick manipulate money so that the Iman can use it, is also naïve enough to misjudge the results. The playwright has given him a difficult task. Fajer Kaisi is very effective as Bashir, the younger and both angrier and more idealistic follower of the Iman. It is he who carries the burden of presenting the third world view of America. The performances of both of these men has deepened since the last production. Anand Bhatt plays Dar, the subservient member of the group. Bhatt conveys the careful waiting and watching the Dar does so that he survives in an ever-changing political and power landscape. Eric Bryant is even more outstanding as Nick. His posture and gestures show us what may have happened (abuse?) before the play opens, but also his confidence as he gets into job. This is a multi-dimensional, layered performance that encourages us to be protective of him while also at times amazed at his sometimes dangerous outbursts. Being closer to the action, you see more of his eyes conveying a range of emotions from alertness to fear to despair. This content is courtesy of Shore Publications and zip06.